VANCOUVER, B.C. - It's that time of year when we all get together to celebrate Canada's birthday, and what it means to be Canadian. It's about letting everyone know what makes Canada special, and why it means so much to be Canadian. Canada is the best country in the world, and on Sunday we will celebrate Canada's 151st birthday. Vancouver Whitecaps FC are represented by 14 different countries all over the world. A lot of athletes love living and working in Canada. It's a unique opportunity for a player who may not have been born in Canada to appreciate all things Canadian. What does it mean to play in Canada, on Canada Day? "It's a big opportunity." Mexican born, Effy Juarez told RedNation Online. "It's one of the most important days in the country. It's a pleasure, and I'm grateful they give me a chance to play on an important day for our country. I think we need to give the satisfaction to all the Canadians. Hopefully we can win, because it's important for us, for the country. It's an important day for everyone." The 6-6-5 Whitecaps FC will take on the 3-9-3 Colorado Rapids on Sunday afternoon at B.C. Place. Taking all three points from Colorado on Canada Day would mean something extra for the club, especially with 20,000 supporters already in a celebratory mood. "We play at home, and it would be a nice gift to the fans, a victory to celebrate." Uruguayan midfielder, Nicolas Mezquida explained. "It's important to win for us, but it's going to be more better if we can celebrate with everyone, and they're happy on Canada Day too." Having a diverse squad is not only key to building a succesful football team, but it broadens minds, and helps bring fans, players, and coaches together. Not only is it an opportunity for Whitecaps FC players, but also their friends, family, and associates. The players take back their positive experiences of playing in Vancouver, and share them with loved ones, who might otherwise not get to travel and visit a country like Canada. "It's amazing." Sierra Leone's Kei Kamara said. "This is a place that I seriously wanted to come to for years, which is Vancouver, and not the other places. It's been amazing, just the MLS teams here, playing in Canada. I've really had an amazing time. Me and my family have been in Vancouver, and being a part of this first celebration, I think it's going to be good. For me personally, it's a game day. I know people are going to be celebrating, but if I can help them celebrate with a victory, it's going to be good." If you spend enough time living in Canada, it starts to grow on you like a flannel sweater, or a double double. Nicolas Mezquida is in his 5th season with Vancouver. He came to the Caps as a young twenty-one year-old, and now he's a blossomed MLS veteran. When he goes back to Montevideo in the off-season he misses his adopted country. He always takes time to share all the wonderful things he loves about playing in Canada. "I try to explain the culture, when I go to Uruguay." Mezquida said. "I try to explain Canada to my friends, ex-teammates, family. How is (it) here, the culture, people. It's similar, it's quiet, it's nice. I feel for Uruguay, but my heart is here. My second home is here." If you spend enough time in Canada, you know that Canadians are as good at taking jokes, as they are at dishing them out. We often hear stereotypes about igloos, hockey, bears, maple syrup, and everything else in between. Having played football all over the world, Juarez has already picked up a few things that Canadians hold near and dear. You might call it an introduction to Canadian living. "Hockey, they love hockey." Juarez said, quickly. "Hopefully in a couple of years they can love soccer. They love hockey, I've been to a couple of games of the Canucks. They love salmon. All the restaurants have salmon. I didn't know it, but they have a lot of different kinds of salmon. I didn't know it until I arrived here. I thought salmon, is salmon. No, you have different kinds of salmon. Maple Syrup, I love maple syrup for the pancakes." It's true maple syrup, and pancakes go hand in hand, and if you're still a little peckish there's always room for a side dish. Kei Kamara knows just what he wants on his breakfast plate. "Canadian bacon, I'm a turkey bacon guy... eh (laughs). People are really really friendly here. A lot of people might say otherwise. I've lived around the states, many places, but Canadians are very friendly." Canadians are so friendly that we often apologize for being too friendly. Whitecaps FC will be looking to pause any hospitality as Colorado looks to earn their first road win of the season. If Vancouver can earn a win, you know they won't be sorry aboot that eh. 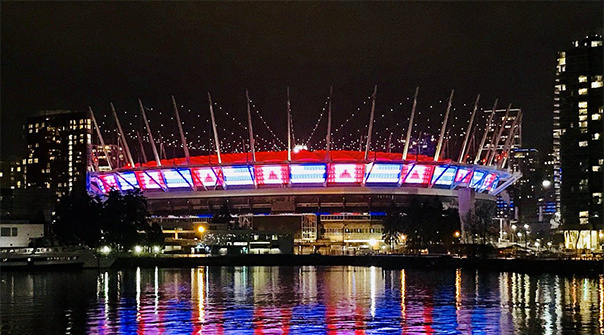 Notes: Vancouver Whitecaps FC will welcome 60 new Canadians on Canada Day during a special citizenship ceremony preceding Sunday's match at BC Place.